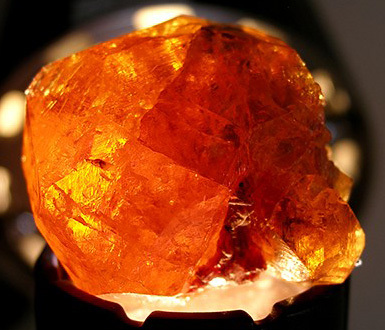 Mandarin Garnet, also sometimes known as orange spessartite, kunene spessartine or hollandine, is a recent discovery in the world of gemstones. 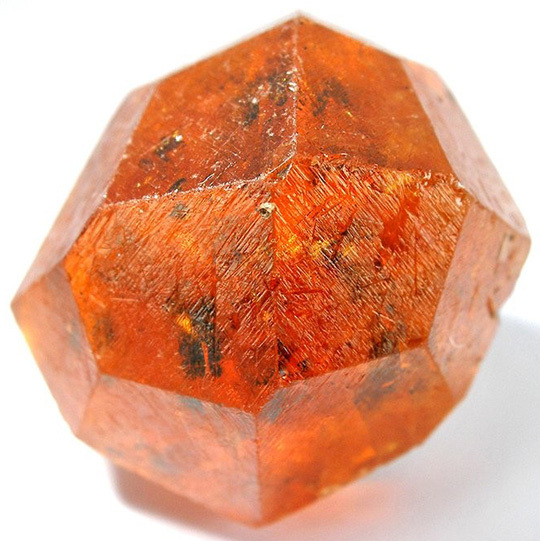 Mandarin garnet is technically a spessartite with a bright orange color. Spessartite is one of the major categories of garnet. From Loliondo, Tanzania - approx 1.3 cm across. As a result of their scarcity, and with some original mine sources being worked out, mandarin garnet is a somewhat uncommon stone with a corresponding price: Looking around online (January 2011), retail prices for fine mandarin garnets in the 2-5 carat range seem to be between $200 and $700 per carat, depending on color and clarity. Larger stones of high quality will command a higher price per carat; however I have seen larger stones of 14-22 carats, cabochon cut, with strong orange color but "cloudy" and lacking clarity, priced at under $100 per carat. Spessartite that is either darker or lighter and without the bright orange color, can be seen for sale at well under $100 / carat. Spessartine has been found in association with quartz, aquamarine, smoky quartz, muscovite, schorl (aka black tourmaline), albite, apatite and feldspar. 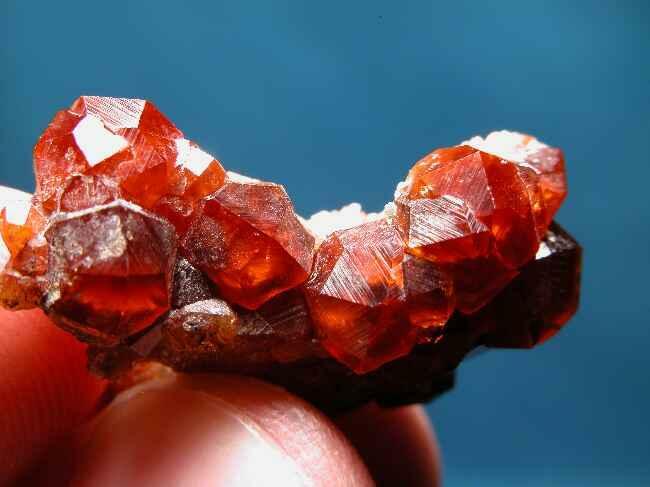 3.3 x 3.3 x 2.3 cm Spessartine (mandarin garnet) from Loliondo, Tanzania.